Mods and Rockers, two rival British youth gangs, on Easter weekend 1964, a long Bank Holiday, met up in various resort locations in England, and violence broke out. The riots on Brighton beach and elsewhere attracted the attention of the press in the United Kingdom and abroad. There seems to be little evidence that there was widespread documented physical animosity between the two groups before the riots that erupted in 1964. 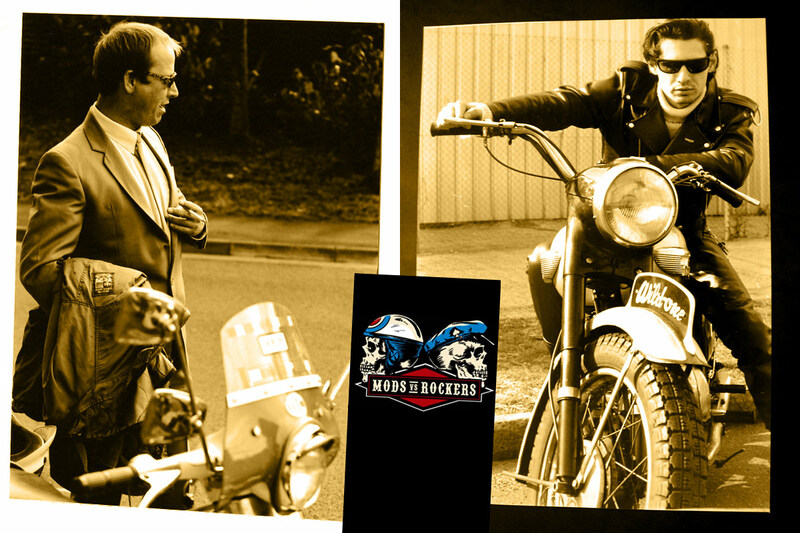 However, the Mods and the Rockers represented two very different approaches taken by disenfranchised British youth. The Rockers were associated with motorcycles, and in particular with the larger, heavy and powerful Triumph motorcycles of the late 1950s. They favored black leather, much like American motorcycle gang members of the era. Their musical tastes ran to white American rock and rollers such as Elvis Presley, Gene Vincent, and Eddie Cochran. By contrast, the Mods made a conscious attempt to appear new (hence, “Mod,” or modern) by favoring Italian motor scooters and wearing suits. Musically, Mods favored modern jazz, Jamaican music, and African American R&B. In the early 1960s, the lines between Mods and Rockers were clearly drawn: the Mods thought of themselves as more sophisticated, more stylish, and more in touch with the times than the Rockers were. The Rockers, however, viewed the Mods as effeminate snobs. Any discussion of Mods and Rockers must also include discussion of the Teddy Boys and Teddy Girls. This segment of the British youth subculture developed after World War II — it predates the Mods and Rockers. Curiously, the Teddy Boys (and Girls) are seen as the spiritual ancestors of both Mods and Rockers. The curious and somewhat confusing mix of various gang-like youth subcultures in the late 1950s in Britain plays a role in the youth-exploitation film Beat Girl. In this 1960 movie — which starred Christopher Lee, Oliver Reed, Gillian Hills, Adam Faith, and Noëlle Adam — one can see elements of the developing Mod culture (the jazz-loving, coffee-bar teen group represented by Faith’s, Hills’s, and Reed’s characters) and a touch of the developing Rocker culture (in the form of a large, American-style car that is used in one sequence from the film, and hair styles worn by some of the minor young male characters). Near the end of the film, a group of Teddy Boys destroy Faith’s sports car. It is interesting to note that the nascent Mods and Rockers of the film seem not to be in conflict with each other, or at least not nearly as much as the “Teds” (as Faith’s character, Dave, calls them) are in conflict with these newer groups. While not detailed the Mods and Rockers per se — they are being used primarily as a metaphor for the changing aesthetics in British youth culture from the 1950s to the early 1960s — it is important to note that sociologists have determined that despite their outward differences (hair, dress, mode of transportation, and so on) the groups share several crucial links. For one thing, members of the youth gangs of the 1950s and early 1960s tended to be working class. And, although some members of the gangs described themselves as middle class, very rarely were Britain’s upper social and economic classes represented in the Mods or Rockers. Likewise, we shall see that skiffle and rock musicians that sprang up within British youth culture in the 1950s and early 1960s also tended to come from the working class. It was the ultimate clashes: the mods vs the rockers, two youth movements in the 60’s that represented a big divide in society, broke into pandemonium at the beach by Palace Pier in Brighton on May 18, 1964. Gangs from each group threw deck chairs, threatened pedestrians in the resort town with knives, created bonfires, and angrily lashed out at one another on the beach. When the police arrived, the teenagers tossed stones at them and staged a massice sit-in on the shore – over 600 of them had to be controlled and approximately 50 were arrested. This now-infamous brawl in Brighton and other seaside resorts over each group’s claim to fame was even documented in the film Quadrophenia, which came out in 1979.